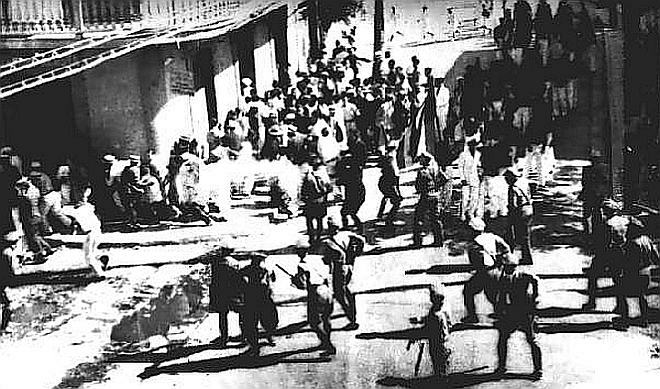 ...was a police slaughtering over a peaceful civilian march, taking place in 21 March 1937 at 3:15 pm, in Palm Sunday, Ponce, Puerto Rico, that killed 19 people and wounded over 200 others. 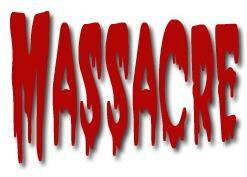 It is the largest massacre in Puerto Rican history. The march had been organized by the Puerto Rican Nationalist Party to commemorate the abolition of slavery in Puerto Rico by the governing Spanish National Assembly in 1873. 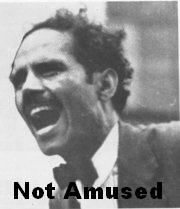 The march was also protesting the U.S. government's imprisonment of the party's leader, Pedro Albizu Campos, on alleged sedition charges. An investigation by the Hays Commission put the blame squarely on the U.S.-appointed Governor of Puerto Rico, Blanton Winship. Further criticism by members of the U.S. Congress led President Franklin D. Roosevelt to remove Winship in 1939 as governor. Governor Winship was never prosecuted for the massacre. No one under his chain of command - including the police who took part in the event, and admitted to the mass shooting - was ever prosecuted or reprimanded. Several days before the scheduled Palm Sunday march, the Nationalists had received legal permits for a peaceful protest from José Tormos Diego, the mayor of Ponce. According to a 1926 Puerto Rico Supreme Court ruling, government permits were not necessary for the use of plazas, parks or streets for meetings or parades. However, as a courtesy to the Ponce municipal government, the Nationalists requested the permit nevertheless. Carlos Torres Morales, a photo journalist for the newspaper El Imparcial was covering the march and took this photograph when the shooting began. However, upon learning about the march, Winship, ordered the new Insular Police Chief, Colonel Enrique de Orbeta, to contact Mayor Tormos and have him cancel the parade permit. He also ordered Orbeta to increase the police force in the southern city, and to stop, "by all means necessary", any demonstration conducted by the nationalists in Ponce. Without notice to the organizers, or any opportunity to appeal, or any time to arrange an alternate venue, the permits were abruptly withdrawn, just before the protest was scheduled to begin. Following Winship's orders, Colonel Orbeta went to Ponce where he concentrated police units from across the island sporting "the latest riot control equipment", among which he also included the machine gunners in the island. For many days, Winship had planned to crush the activities of the Nationalists and their leader, Pedro Albizu Campos, and ordered the shootings. Juana Diaz, Police Chief Guillermo Soldevilla, with 14 policemen, took a position in front of the marchers. Chief Perez Segarra and Sgt. Rafael Molina, commanding nine policemen armed with Thompson submachine gunsand tear gas bombs, stood in the back. Chief of Police Antonio Bernardi, heading 11 policemen armed with machine guns, stood in the east; and another group of 12 police, armed with rifles, was placed in the west. According to some reports, police numbered "over 200 heavily armed" guards. As La Borinqueña, Puerto Rico's national song, was being played, the Ponce branch of the Cadetes de la República under the command of Tomás López de Victoria and the rest of the demonstrators began to march. The Insular Police then started firing on the marchers - killing 17 unarmed civilians, two policemen, and wounding some 235 civilians, including women and children. A seven-year-old girl was also killed by a bullet. Police firing went on for over 15 minutes. The dead included 17 men, one woman, and the seven-year-old girl. Some of the dead were demonstrators, while others were simply passers-by. As of 2009, only two survivors were still known to be alive, Fernando Velez and his sister Beatriz Velez, nephew and niece of patriots Emeli Velez and Erasmo Vando. Many were chased by the police and shot or clubbed at the entrance of their houses as they tried to escape. Others were taken from their hiding places and killed. Leopold Tormes, a member of the Puerto Rico legislature, told reporters how a policeman murdered a nationalist with his bare hands. Dr. Jose N. Gandara, one of the physicians who assisted the wounded, testified that wounded people running away were shot, and that many were again wounded by the clubs and bare fists of the police. No arms were found in the hands of the civilians wounded, nor on the dead ones. About 150 of the demonstrators were arrested immediately afterward; they were later released on bail. The next day, Governor Winship radioed Washington and reported, officially, that the Nationalists had initiated the shooting. Part of his radiogram report stated that "two shots were fired by the Nationalists…with Nationalists firing from the street, and from roofs and balconies on both sides of the street... the police showed great patience, consideration and understanding of the situation, as did the officers and men under him, the Police Chief." The following day, as a result of this misinformation, the New York Times and Washington Post reported that a Nationalist political revolt had claimed the lives of over eighteen people in Puerto Rico. The Puerto Rican senator Luis Muñoz Marin traveled to the city of Ponce to investigate the event. After examining the photograph taken by Carlos Torres Morales of El Imparcial, which had not yet been published, he wrote a letter to Ruth Hampton, an official at the United States Department of the Interior. He said that the photograph showed that the policemen were not shooting at the uniformed Nationalists (Cadets), but at a terrified crowd in full flight. A Puerto Rican government investigation into the incident drew few conclusions. A second, independent investigation ordered by the United States Commission on Civil Rights. This investigation concluded that the events on March 21 constituted a massacre and mob action by the police. The report harshly criticized the repressive tactics and massive civil rights violations by Governor Winship. 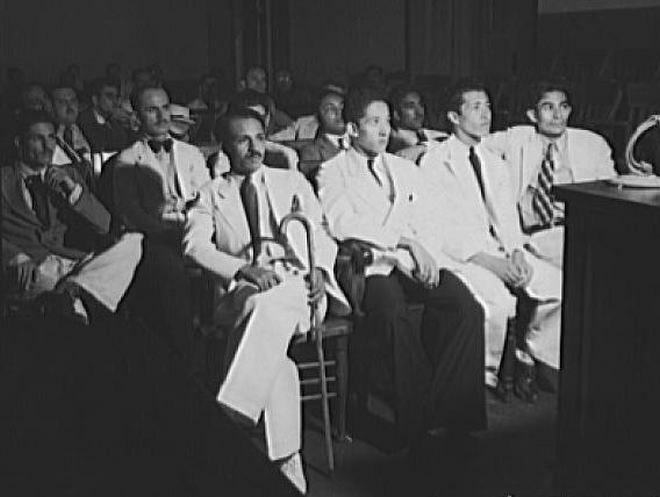 Defendants during the trial of the Nationalists at the former Spanish Army barracks in Ponce, Puerto Rico. (December, 1937). In the aftermath of the massacre, no police officer was convicted or sentenced to jail. No police were demoted or suspended and Governor Winship never issued a public apology. The Ponce Massacre reverberated through the U.S. Congress. On the House floor, Congressman John T. Bernard expressed his shock and outrage. A record of his speech is found in the Congressional Record. It says, "The police in Ponce, probably with the encouragement of the North American police chief and even the governor, opened fire on a Palm Sunday Nationalist march, killing seventeen and wounding more than two hundred." Later, Congressman Vito Marcantonio also joined in the criticism, filing charges against Governor Winship with President Roosevelt. The year following the Ponce massacre, on 25 July 1938, Governor Winship wanted to mark the anniversary of the US 1898 invasion of Puerto Rico with a military parade. He chose the city of Ponce to demonstrate that his "Law and Order" policy had been successful against the Nationalists. During the parade, shots were fired at the grandstand where Winship and his officials were sitting in an attempt to assassinate him. It was the first time that an attempt was made on a governor's life in Puerto Rico. Winship escaped unscathed, but two men were killed and 36 other people were wounded. 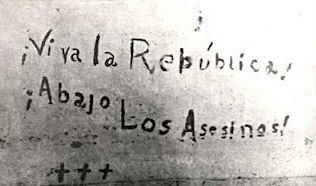 The dead included the Nationalist Angel Esteban Antongiorgi and National Guard Colonel Luis Irizarry. The Nationalist Party denied participation in the attack, but the government arrested several Nationalists and accused nine of "murder and conspiracy to incite violence." Among the nine Nationalists charged and convicted were Tomas Lopez de Victoria, captain of the Ponce branch of the Cadets of the Republic, and fellow cadets Elifaz Escobar, Santiago Gonzalez Castro, Juan Pietri and Prudencio Segarra. They served 8 years in the Puerto Rico State Penitentiary. The four were pardoned by the next full-term US-appointed governor, Rexford Guy Tugwell. Winship tried to repress the Nationalists. Jaime Benitez, a student at the University of Chicago at the time and later long-time chancellor of the University of Puerto Rico, wrote to President Roosevelt stating, "Governor [Winship] himself through his military approach to things has helped keep Puerto Rico in a unnecessary state of turmoil. He seems to think that the political problem of Puerto Rico limits itself to a fight between himself and the Nationalists, that no holds are barred in that fight and that everybody else should keep out." Winship was replaced in 1939. 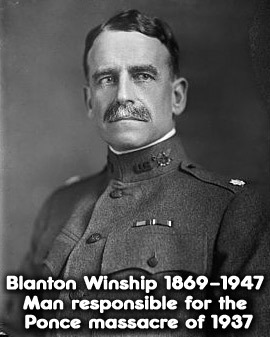 Marcantonio had continued to draw attention to Winship's egregious actions, appealing to Roosevelt to replace him. In his speech before Congress titled "Five Years of Tyranny", U.S. Congressman Vito Marcantonio reported how "Ex-Governor Blanton Winship, of Puerto Rico, was summarily removed by the President of the United States on May 12, 1939" after Marcantonio had filed charges against Mr. Winship with the President. In his speech, Congressman Marcantonio detailed the number of killings by the police and added, "the facts show that the affair of March 21 in Ponce was a massacre...Governor Winship tried to cover up this massacre by filing a mendacious report." He called Governor Winship "the tyrant". 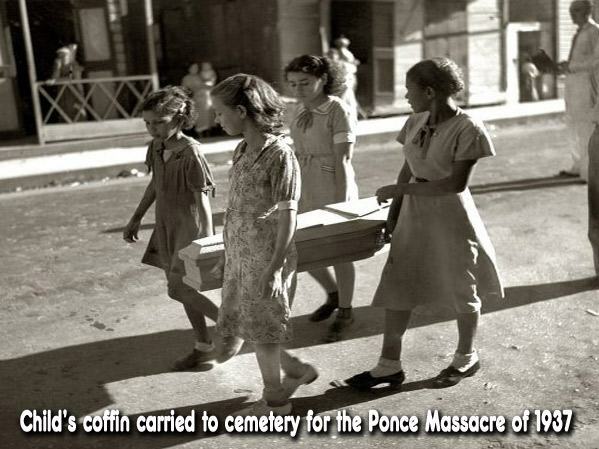 Today, the Ponce massacre is remembered and memorialized annually in honor of the Puerto Ricans who perished or were wounded for their political beliefs. 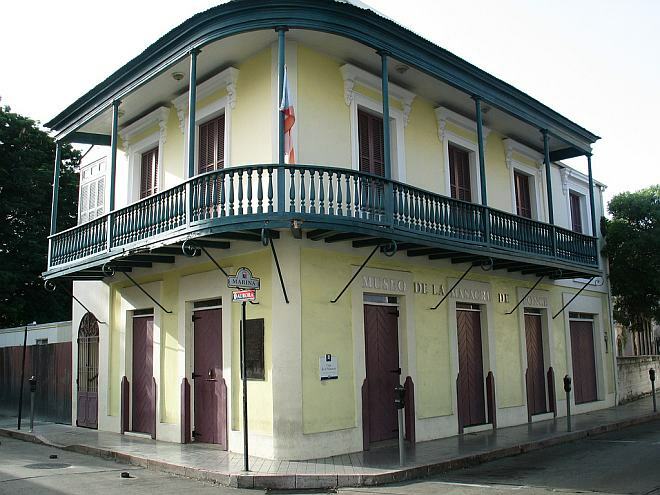 The Institute of Puerto Rican Culture, an agency of the Government of Puerto Rico, operates the Ponce Massacre Museum. It is located at the intersection where the events took place (corner of Marina and Aurora streets). The museum houses photographs and various artifacts from the Ponce massacre. A section of the museum is dedicated to Dr. Pedro Albizu Campos.